Bordeaux France is a UNESCO world heritage site. It is known for its 18th century architecture. Bordeaux region is a port city on the Garonne River in southwestern France. It’s known for its Gothic Cathédrale Saint-André, 18th- to 19th-century mansions and notable art museums. Public gardens line the curving river quays. The Grand Place de la Bourse, centered on the Three Graces fountain, overlooks the Miroir d’Eau reflecting pool and much more. Arrive beautiful Bordeaux and meet local coordinator, transfer to meet your new French host family for the next 12 days enjoying a full immersion into French life where you will be given a brief by our local French teacher what life in France will be like and what to expect. You will be living with a local French host family while in Bordeaux to improve your speaking skills. Delicious local French patisserie, croissants, baguettes, macaroons while having a coffee with friends and improve your speaking skills with teenagers your own age. Full day of sightseeing of beautiful french town sharing the history, architecture and culture dating back to the 18th century. Attend local high school with full integration, improving your speaking skills while attending classes and make many lifelong friends. Weekend with your host family and new friends and enjoy the local immersion of family, friends and Bordeaux life as a local a teenager. Attend local high school with full integration, improving your speaking skills while attending classes and make farewell to all your new friends at school. Today you say farewell to your host family and travel with Group Chaperone by train to Paris. Early 0800 departure to make the most of our time to see all the wonderful sights in Paris. While in Paris you will visit stay right in the heart of Paris in a 3 stay hotel. Chaperone Leader take you sightseeing in Paris and enjoy all the well know sights. Board the hop on hop off bus with a full English commentary/. You will see all the wonderful sights of Paris you have dreamed, heard and read about in all your French lessons at school. The Eiffel Tower, the Louvre or Musee d’Orsay, The famous Seine river, Walk Champs’ Elyse, Arc de Triomphe, Notre-Dame Cathedral, Sacre Coeur, Montmarte. Wander through Tuileries Garden the largest and most beautiful garden in Paris, Place de la Concorde this is one of the major public squares in Paris, France. Measuring 8.64 hectares in area, it is the largest square in the French capital. the site where Queen Marie Antoinette met her death and the where the Luxor Obelisk stands proud, a gift in the 19th Century from the Egyptian government. Walk over the Seine via many bridges such as the famous beautiful Pont Neuf and lots more. 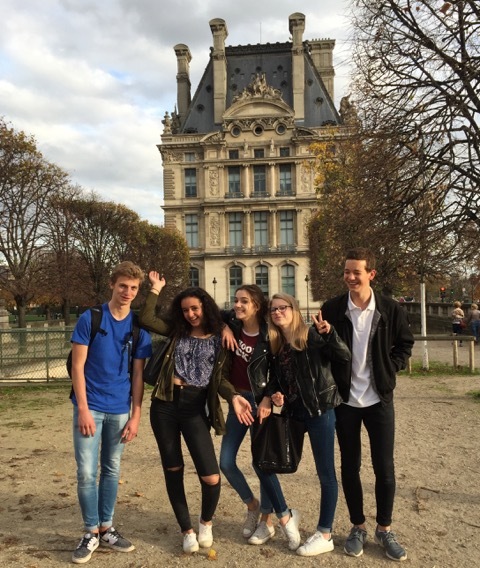 What will I gain from joining the French High School Cultural Exchange study tour ? You will improve your speaking skills when you speak with local students your own age while attending a traditional French High school. You will learn more about the culture and eat the most delicious traditional foods you will ever taste. 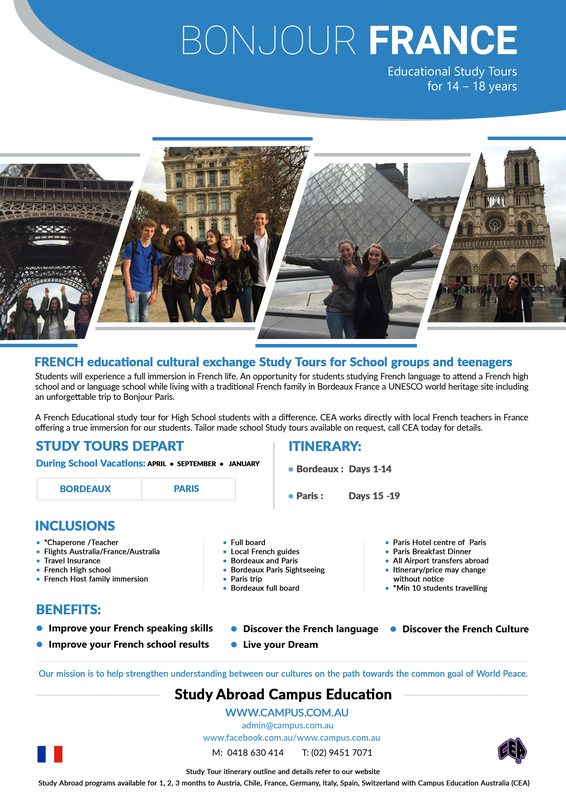 You will return back to school with a new insight, passion and excitement of the French language and this will help you excel in your class and your exams because you have lived the dream, spoken the French language and experienced the culture and food. This passion will go from your head to your heart. Visa not required on a visitor visit under 90 days. To improve my French speaking skills. Experience living with a great local French host family. Attend a local French high school.